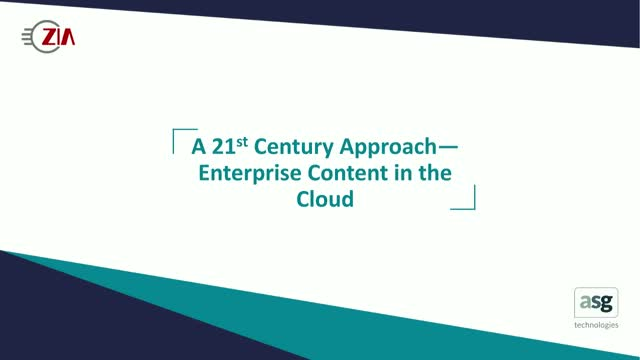 As leading-edge enterprises Modernize their Infrastructure, Content Solutions are increasingly moving toward Cloud delivery. Research confirms that 67% of businesses are looking at the Cloud to extend their Content Solutions and provide device-agnostic access to employees. Hear Greg Wilson of ASG Technologies and Ryan McVeigh of Zia Consulting discuss how enterprises are utilizing cloud and hybrid environments to achieve agile business processes and workflow flexibility and manage content for regulatory compliance. They share the top six reasons to move your content to the cloud along with a methodology that removes risk from the process and helps enterprises more strategically meet their business goals.